A number of Europeans and Indian travellers and officers of the East India Company visited Punjab during the reign of Maharaja Ranjit Singh. Many of them maintained diaries and published them as memoirs, travelogues and works of history. Some of these were published during the life time of the Maharaja. Others continued to publish their works during the tenures of the successors of the Maharaja till the fall of the kingdom of Lahore. All the contem­porary and near contemporary writers in English are Europeans and they constitute the first part of this monograph. They claim to be giving the true picture of the Sikhs in general and of Ranjit Singh in particular. Their intended readership was primarily British public, who they thought, ought to know about the personality of the Maharaja and origin and growth of his kingdom. The writers belonged to widely different socio-cultural backgrounds and socio­political identities. Their views were influenced by the historical situations in which they wrote. Their interests ranged from intel­lectual curiosity to idle fancy or self-interest in practical, political and even personal terms. The evidence they used and the purposes for which they wrote were reflected in their works. The travellers had impressionistic approach and the Maharaja was not the focus of their interest and, therefore, they do not fall within our scope. There were others who were the servants of the East India Company. 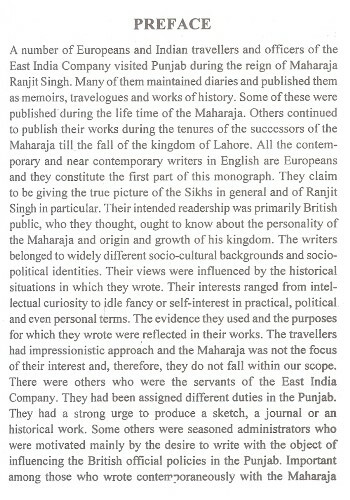 They had been assigned different duties in the Punjab., They had a strong urge to produce a sketch, a journal or an historical work. Some others were seasoned administrators who were motivated mainly by the desire to write with the object of influencing the British official policies in the Punjab. Important among those who wrote contemporaneously with the Maharaja and his successors are Henry T. Prinsep, W.G. Osborne, Lt. Col. Steinbach, W.L. M'gregor, Carmichael Smyth and Joseph Davey Cunningham. Prinsep's Origin of the Sikh Power published in 1834 is considered as the first historical writing on the Sikhs and the Punjab. All the successive scholars have relied upon his authority on the subject. He was followed by Osborne in 1838. Osborne was a Military Secretary of Lord Auckland, Governor General of India and had come to Punjab as a member of the team of Mcnaughten on a mission to the court of Ranjit Singh. He visited the Maharaja and watched his personality and the court and courtiers from a close quarter. He recorded his minute observa­tions in the book that he called a journal, The Court and Camp of Ranjit Singh. Steinbach (1845) had been in the Army of the kingdom of Lahore during the reign of Maharaja Ranjit Singh. His services were terminated after the death of the Maharaja. His work, though biased, describes the geography, polity and economic potential of the kingdom of Lahore. He emphasised that the annexation of the 'extensive and fertile' territory of the Punjab was in the interest of the British. Carmichael Smyth's work is of polemical nature. He was interested in everything negative asso­ciated with the person and polity of Maharaja Ranjit Singh. Though a critic of the British, he believed that the kingdom of Lahore should not have been allowed to grow as strong as it had become during the reign of Ranjit Singh. M'gregor, the physician though claims to depict the true personality of Ranjit Singh yet reflects his concern in the consolidation of the British power in North- West India in general and the Punjab in particular. Common to these five Europeans is their dominating concern that Punjab should be a part of the British Empire. Osborne was shrewd enough to observe that after the death of Ranjit Singh there will be two warring parties and there will be no other option for them than to seek British intervention as the third and the strongest party. He like others observed and convinced himself that there will be chaos in the Punjab after the death of Ranjit Singh as he did not have any successor equal to his own calibre and wisdom. Chaotic Punjab was not in the interest of the British. The first five Eu­ropeans taken up in the monograph had done this exercise from the perspective of growing British interest in the North Western parts of India, particularly the Punjab. Punjab was strategically situated as the gate way to Central Asia and Afghanistan and it was of immense commercial value as well. On the whole, they tried to familiarize the British public about the necessity of the annexation. They therefore, attempted to influence the attitude of the British towards the Punjab. In this context Joseph Davey Cunningham is the only exception. He was sympathetic to the Sikhs and had to pay for his expression of sympathy with them by his removal from the service of the East India Company. The second part of the monograph consists of the historians who wrote after the annexation of the kingdom of Lahore. Their concerns were different from those of the writers of Pre-British period. For the historians of pre-British period the annexation was a necessity. In the post annexation period their concerns changed. For Syad Muhammad Latif, the first Indian scholar to write in English, it was pertinent to glorify the 'blessings of the Raj'. His voluminous work was entitled History of the Panjab (1989). He proceeded with the assumption that the rulers earlier than the British were 'bar­barous'. The British had ushered in an era of 'enlightenment'. The British Raj was the best thing that had happened in the Punjab. In the early twentieth century socio-political conditions in the Punjab had undergone significant changes and a process of fresh analysis of the policies of the British by intellectuals had begun. The new questions were asked and their answers sought. New sources of information were discovered and new tools were evolved to interpret it and new points of views emerged. By the third decade of the twentieth century, the Indian National Movement had matured into a mass movement for complete independence from the British Raj. It was reflected also in the historical writings on the Punjab. 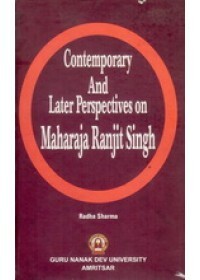 Three important works on Ranjit Singh were published in 1928, 1931 and 1933 by G.L.Chopra, N.K. Sinha and Sita Ram Kohli translated his work from Urdu to Punjabi in 1951 respectively. These scholars based themselves on the historical evidence in Persian which had not been used and analysed by earlier scholars. The interests of these scholars were inspired purely by academic considerations, that is, with a genuine desire to understand the past in its own terms. These authors published their works on the subject almost contemporaneously but they do not appear to have seen one another's work. N.K. Sinha, for example, contains no reference to G.L.Chopra's book. G.L. 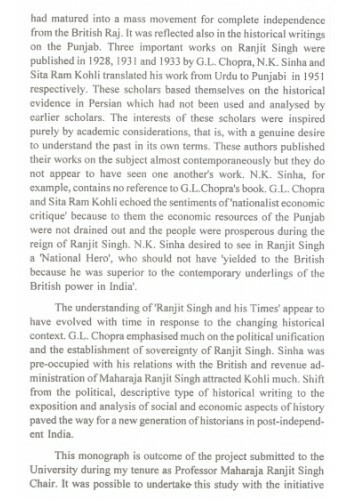 Chopra and Sita Ram Kohli echoed the sentiments of 'nationalist economic critique' because to them the economic resources of the Punjab were not drained out and the people were prosperous during the reign of Ranjit Singh. N.K. 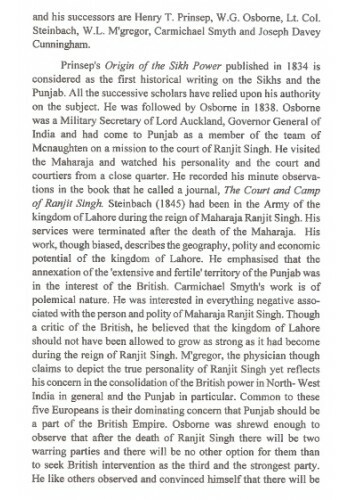 Sinha desired to see in Ranjit Singh a 'National Hero', who should not have 'yielded to the British because he was superior to the contemporary underlings of the British power in India'. The understanding of 'Ranjit Singh and his Times' appear to have evolved with time in response to the changing historical context. G.L. Chopra emphasised much on the political unification and the establishment of sovereignty of Ranjit Singh. Sinha was pre-occupied with his relations with the British and revenue ad­ministration of Maharaja Ranjit Singh attracted Kohli much. Shift from the political, descriptive type of historical writing to the exposition and analysis of social and economic aspects of history paved the way for a new generation of historians in post-independ­ent India. 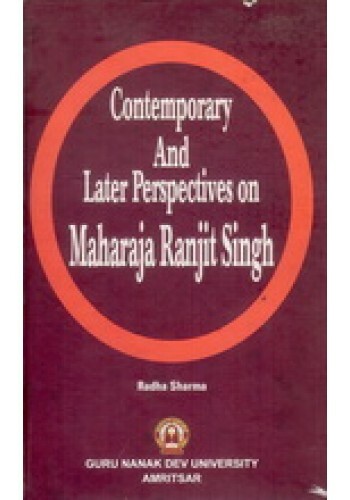 This monograph is outcome of the project submitted to the University during my tenure as Professor Maharaja Ranjit Singh Chair. It was possible to undertake this study with the initiative taken by Dr. H.S. Soch former Vice Chancellor, in establishing Maharaja Ranjit Singh Chair at Guru Nanak Dev University, Amritsar. I am thankful to him. I feel gratified to acknowledge the encouragement and support extended by Professor S.P. Singh, Vice Chancellor, Guru Nanak Dev University, Amritsar in the formulation, completion and publication of this monograph. I am extremely thankful to him. It is gratifying to acknowledge that the inspiration to under­take this work came to me from my teachers Professor J.S. Grewal and Professor Indu Banga. I will remain indebted to them always. I am thankful to Librarians Bhai Gurdas Library and of the Library of the department of History, Guru Nanak Dev University for all the help during the course of the study. The secretarial staff of the department of history deserves appreciation for their co­operation during my tenure on the Chair. Ms Renu my research student has also been helpful to me. I am thankful to them all. This work wouldn't have been possible without constant help, support and critical reminders of Harish, and my daughters Divya and Sumedha. 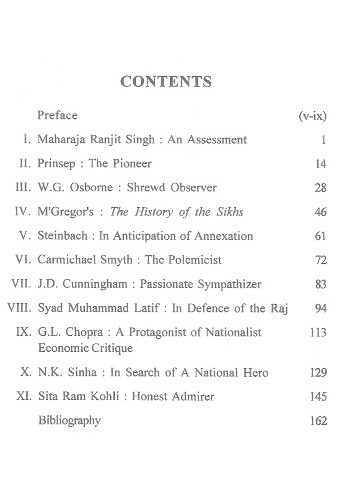 The monograph is an analysis of the perspectives of historians on Maharaja Ranjit Singh including six Europeans---Prinsep, Osborne, M'Gregor' Steinbach, Carmicheal Smyth and Cunningham and four Indians---Muhammad Latif, G.L. Chopra, N.K. Sinha and Sita Ram Kohli. 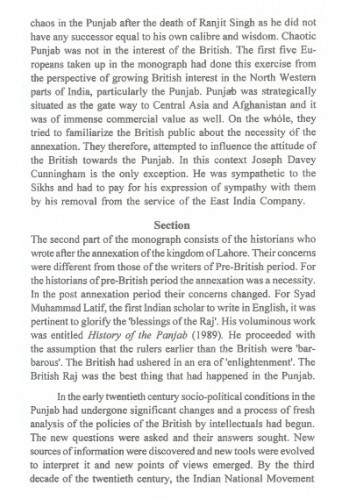 The European writers with the exception of Cunningham wrote from the perspective of growing British interest in the Punjab as a strategically located gateway to Afghanistan and Central Asia. They produced their works to familiarize their readers, mainly the British, with the person of the Maharaja and his successors, besides the geography, polity and economic potentials of the fertile and vast territories of the Punjab. They viewed Punjab prospectively as a part of the British Empire. Among the Indian historians Syad Muhammad Latif published his History of the Punjab in 1891. He assessed the Maharaja from the perspective of a collaborator of the Raj. The works of G.L. Chopra, N.K. Sinha and Sita Ram Kohli published during the 1930's were inspired by academic considerations and were based on contemporary Persian documents. Their works reflected the concerns of their own times as well. G.L. Chopra and Sita Ram Kohli echoed the sentiments of the Nationalist Economic Critique as the resources of the Punjab were not drained away and people were prosperous during the reign of the Maharaja. It was a reaction to the claims that Punjab became prosperous under British rule only. N.K. Sinha sounds remorseful of the Maharaja's yielding to the British though he was much stronger than all the contemporary British underlings. He was, in fact, searching for a national hero in the person of Maharaja Ranjit Singh.